The tides were particularly large on the weekend of the 22nd February 2015, leaving Ogmore beach, where we scattered dad’s ashes in December 2013, totally different to how it had ever been before. While there has been a difference every time we have visited the beach, this was particularly striking as there were large expanses of rock instead of the usual deep layer of pebbles and rocks. I will post these pics one day soon! While we live close to the sea in South Wales, we don’t come into daily contact with it; having to make the effort to go down to the seashore outside of the city in order to enjoy it. We are though, well aware of the fact that Spring and Autumn tides occur when the moon is closer to the Earth and also that when the moon is closer to the Equator at the same time, then the Spring tide is higher than usual. Did you know: Tides have an 18 year cycle! Very wet winters which see river banks in the UK full to overflowing before the Spring tides occur, leave floodplain areas, towns and villages along valley lines where the rivers tip into the sea particularly vulnerable and in December 2013 to January 2014, the results of the Spring tide were devastating to many such communities (people and wildlife), some of whom are still feeling the effects. While it might seem like stating the obvious to the surfers and sea-dwellers, I hadn’t really made the connection between the weather and the Spring Tide until late February this year when we happened to find ourselves spending a few days away at a beautiful shoreline hotel in Dorset. The weather was filthy from the 20th onwards and we didn’t set much hope for being able to even stand on our harbour view balcony when we arrived on the Sunday, let alone to study the tides but happily this part of the UK is better sheltered and by Monday morning we could nip outside to look at least! 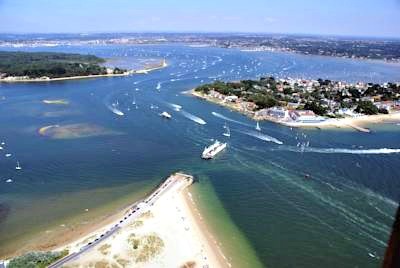 What made it noticeable were two things – this is a huge estuary with a chain ferry which is anchored to the route across to stop it drifting off in the very strong currents and the numerous buoys. While low tide didn’t look especially low, it was after the Spring tide that we could see that during the phenomena hardly any of the height of the buoys could be seen they were now almost completely exposed and that the chain on the ferry which before we could only hear paying out at the shoreline we could now actually see! 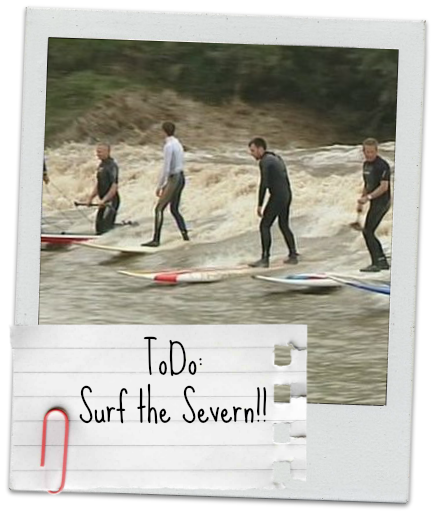 Gumby had an ambition which he sadly didn’t fulfil, to surf the river Severn Spring bore which ends in the Bristol Channel. This is an annual event during Spring and Autumn which surfers and more recently kayakers, seem to get a big buzz out of, This year was no exception! So, to all you sea-surfers who fancy doing something wild, different and awesome, check it out and perhaps one of these seasons you’ll give it a go? Please let us know if you do as we’ll be right there to support and watch! !